Featuring gorgeous swirls of color against a backdrop of a starry night, this is an upbeat and modern five-minute countdown designed to let people know when your service or event will begin. This countdown also features a modern and cheerful version of "Joy to the World". 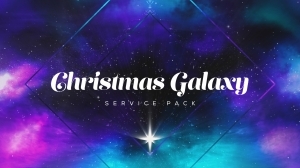 Perfect for your Christmas services!